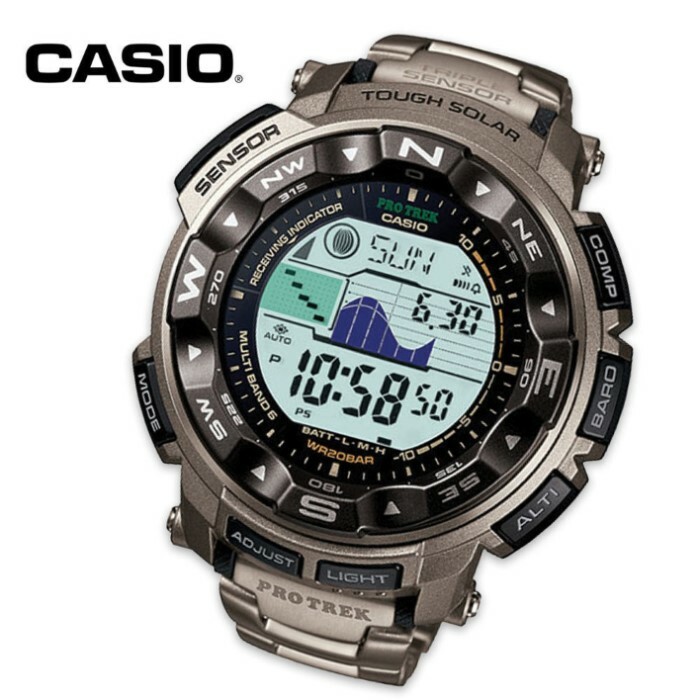 Casio Pro Trek High Performance Wristwatch With Thermometer | BUDK.com - Knives & Swords At The Lowest Prices! The Casio Pro Trek High Performance Wristwatch sets the standard for professional sport watches, offering multi-band six atomic timekeeping ability. Other key features include duplex LCD, a combination altimeter/barometer/compass, tide and moon graph data, five daily alarms and world time (48 cities). The fully auto electroluminescent backlight provides afterglow, and the 1/1000-second stopwatch and countdown timer give you pin-point precision and accuracy. Best of all, it's low temperature resistant and water resistant to 200 meters. You can't beat the value that's packed into this Casio wristwatch. It's the perfect watch for sportsmen, outdoorsmen and fishermen.